From the files of the Montreal Gazette comes a little-known revelation about one of the NHL’s most consistent wingers—Mike Gartner. Skating with Washington, Minnesota, N.Y. Rangers, Toronto, and Phoenix, he set a record which still stands—seventeen 30-goal seasons. Hidden away in a game report on February 28, 1983 is an almost incidental comment: “despite weakness in one eye”. The league’s powers-that-be have often been cast as heavies when it comes to disallowing one-eyed competitors to participate in games. Gartner’s iffy peeper is a simple reminder of the logic behind bylaw 12.6; namely that puck chasers who have lost 75% vision in either eye are in constant danger of injury to their other one. Not only does this protect the players themselves, but spares the circuit from unreal insurance costs related to accidental blindness, should it be incurred by a team member. This has been dubbed the “Trushinski Bylaw”. Frank Trushinski, while playing for the Kitchener Greenshirts in 1921 lost one eye as the result of a fractured skull due to an on-ice collision. He returned to action, and in 1923 was hit with the puck and lost most of the sight in the other eye. As far back as 1939 President Frank Calder took a strong stand against George Parsons returning to competition after he had lost his sight permanently in one eye. He was no longer allowed in the NHL. Greg Neeld, who was the victim of an errant high stick from Dave Maloney in 1973, sought to overturn the ruling, taking the issue to the courts. He contended that his specially-designed shield could adequately protect him from further damage. But a U.S. Federal Court judge refused to block the NHL’s bylaw, and the fledgling rearguard lost his appeal. League governors also affirmed the stance by a 13-3 vote in 1975. While Neeld’s tactic failed, Bryan Berard found a legitimate way the bypass the blockade. It’s called modern medicine. On March 11, while skating for the Maple Leafs, the Senators’ Marian Hossa’s accidental follow through clipped the American-born rearguard, tearing and detaching the retina in his right eye. For all intents and purposes his career seemed to be over. In fact he was granted a 6.5 million dollar insurance settlement for his ‘career-ending injury’. But even as he lay in the hospital he insisted he would play again. After seven operations, and being fitted with a special contact lens, he was able meet the league standards for vision. He returned the insurance money, and hooked up with the New York Rangers. He followed up with short stints with Boston, Chicago, Columbus, and the Islanders, before jumping to the Russian KHL. The list of hockeyists who have had to abandon the game for this very same reason is long and disturbing. Besides the aforementioned George Parsons, Doug Barkley, Barry Ashbee, Bernie Parent, Glen Sharpley, Henry Boucha, Pierre Mondou and Chris Pronger, head the seemingly endless list of victims of this debilitating misfortune. But there were a number of Major League puck chasers, some before, and some after the introduction of the league’s vision policy, who rose above this disability and made a name for themselves in Canada’s National Sport. To be sure, the most renowned of all who terrified goalies with his scoring prowess in spite of this handicap, was “One-Eyed” Frank McGee. He suffered the loss of one eye in amateur hockey while playing for his home-town Ottawa Seconds. And, although his family opposed it, he moved up to the Silver Seven in 1903, patrolling the ice in the CAHL, the equivalent to the NHL today. His statistics are nothing short of phenomenal: 14 goals in six games; 12 in four matches; 17 in six contests; and 25 in only seven. His overall total was 68 tallies in a mere 23 games. Had he not given his life in the service of his country during World War I, it is difficult to guess what his eventual “line score” would have been. Leo Reise Sr. joined the Hamilton Tigers in 1920, when the NHL was only three-years old. He had guarded the blueline for the Bengals while they were still on the OHA Senior circuit, then turned pro when the club stepped up to the pay-for-play level. As a youngster he lost vision in one eye, not because of an injury, but because a nerve withered away leaving it useless. It seemed never to hinder him, to the extent that opposition players couldn’t seem to guess which eye was sightless. He moved to the WCHL Saskatoon Crescents for a few seasons, then hooked up with the New York Americans, the club which had its roots in the old Steel City sextet. He retired from NHL play after a handful of games with the co-tenants Rangers in 1930. Jimmy Ward was often described as one of the game’s ideal wingers. He went back and forth, up and down that corridor, skating like the wind, and letting his hard shot fly at opposition goaltenders. He was a fan favourite, even though he was not a prolific scorer. He was part of the line, which, when “Hooley” Smith replaced him, became the famous “S” line—a trio that dominated the NHL from 1927 through 1932. Ironically, he later became a teammate with “Hooley” (and “Baldy” Northcott), forming the “Red Line” for the Maroons. Often this unit was assigned a checking role, sent out to shut down the opposition’s production aspirations. He was a bit of a hard luck skater, once missing a sizeable chuck of the latter part of a season with a severe bout of the flu. But his worst experience is recorded in game reports on January 23, 1935. That evening he was on the receiving end of a hard check by Boston’s Eddie Shore. When he dropped his “head hit the ice with a sickening thud”. Local sport’s pages made much of the fact that just a year earlier, on that very spot on Boston Garden ice, “Ace” Bailey had been smashed to the playing surface by the “Edmonton Express”, resulting in a skull fracture. The Fort William native regained his feet, and joined the play. But when he came out of the dressing room following the between-period rest, he couldn’t keep track of the puck. He collapsed on the bench and was rushed to hospital. Initially it was suspected he had a skull fracture. But a severe concussion was the final verdict. Hal Cooper is hardly a household name in hockey’s Big Time. Most of his career was spent in the amateur ranks, with teams like the Falconbridge Falcons, the Niagara Falls Cataracts, and the Hamilton Tigers—all Senior hockey sextets. He reached the apex of his tenure at that level with the Kirkland Lake Blue Devils. He was a member of the top line on that 1940 Allan Cup Championship club, and, drew the attention of none other than Conn Smythe, the Maple Leaf’s chief cook and bottle washer. But the talent-starved New York Rangers, victims of players exiting to serve in World War II, were nabbing everyone except stick boys to try to pull them out of the shinny doldrums. When management saw Cooper’s success in the AHL with Providence, they promoted him to the big club. The eye ailment, which prevented him from seeing objects up close, possibly was the main reason he sported the Blueshirt’s togs for but eight games—a stint which got his name in the record books only because of a two-minute minor penalty. One of the most ironic scenarios in NHL history involved Finnish-born Pentti Lund. In his second full season with the New York Rangers, in the 1949-50 semi-finals against Montreal, not only did he almost totally shut down the game’s most prolific goal scorer, but he himself ended up being a hero in the five-game series. He managed 5 goals and added 4 helpers, while shadowing none other than “Rocket” Richard, allowing him only one tally and one assist in the Manhattan sextet’s elimination of the favoured Habs. In fact he ended as the leading scorer in the post season, while Richard placed 32nd in the points race. It was, in a sense an anti-climax for the underrated winger. After one more campaign on Broadway he was traded to the Bruins. The new season barely got underway when Clare Martin accidently clipped Lund in the eye. In his own words he related what happened after the incident: “I was taken to the hospital and spent nine days there. The doctor advised me to retire—advice that I mentioned to newspapermen when they asked questions on my first trip back to Boston Garden after the injury. After reading these reports Art Ross advised me to go back to Port Arthur—advice I did not heed. Lund worked out with the Cougars during training camp, but signed retirement papers, and returned home. He played Senior hockey in Sault St. Marie for two campaigns, but eventually settled into a career as Sports Editor of the Thunder Bay Daily Times Journal. Any serious hockey fan would be quick to acknowledge that Willie O’Ree was the first black to play in the NHL. On January 18, 1958 he pulled on the colours of the Boston Bruins for a match against the powerful Montreal Canadiens. 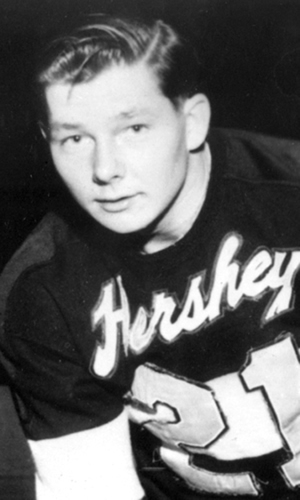 He was promptly sent back to the Quebec Aces of the QHL after only two games. But what may not be as readily remembered is that he was blind in one eye. In fact he played all of his pro career hampered by that handicap. Incredible as it seems he managed to keep the ailment a secret over the course of time. While playing junior hockey in Kitchener he was hit in the right eye with a slap shot, unable to get out of the way because he was cross-checked at the moment the disc hit him in the face. Understandably the doctor who treated him told him he would never play the game again. But he was deadly determined not only to get on skates again, but to make it all the way to the NHL. When he was picked up by the “Punch” Imlach’s Quebec Aces in 1956 he made the team, somehow not having to disclose the fact that he was “half blind”, as he put it. What is even more amazing is that, as a left winger, he had to turn his head half way around to be able to see a pass. It wasn’t until he moved to the Los Angeles Blades of the WHL that coach Alf Pike asked him to switch to right wing—which allowed him to more easily pick up forward passes slid his way. While his stay in the Big Time was brief initially, the Bruins recalled him once more, this time while he was starring with their EPHL Kingston Frontenacs. During his 43 contests in 1960-61 he managed 4 goals and added 10 assists. But, even though he was promised he would return the following campaign, in reality, he was traded to the Canadien’s organization, finishing the year with their farm team, the Hull/Ottawa Canadiens. Willie saw the handwriting on the wall, knowing that the Habitants would never use him. Later in the following season he moved to L.A.—where he began his 13-season tenure in the WHL circuit. It would not be fitting to conclude this missive without making reference to one more shinny personality, whose career in the NHL spanned 16 seasons. 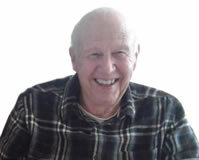 His name in Bill Chadwick, linesman and referee in the world’s premier hockey fraternity. His place in the game was totally different—and totally difficult—but is equally deserving of honourable mention. When irritated fans, players, coaches, or managers accused him of being “blind”, he always said they were “at least half right”—because he called plays year in and year out sans sight in his right eye. While playing in the Metropolitan Junior Hockey League in his home town of New York, he had just stepped on the ice for the pre-game warm up, when an opposition skater carelessly let fly with a drive that hit the “Big Whistle” flush in the face. And at that very moment “Buster” Chadwick knew he was done too—with hockey playing. The possibility of losing the other eye was just too great a risk! But as “luck” would have it, while sitting in the stands one night watching an EHL match, the league in which he had played, he was called upon as an emergency replacement for the referee who was snow-bound. That was just the beginning. Before he hung up his skates in 1955, he had been the most highly-respected whistle tooter for over 1000 NHL games. There is little doubt that the above pucksters would say a hearty “amen” to this statement by authoress Ursula Le Guin: “We scarcely know how much of our pleasure and interest in life comes through our eyes until we have to do without them."